WEST LAFAYETTE, Ind. - Removing corn stover from agricultural fields to produce cellulosic ethanol requires careful management to avoid adding greenhouse gas emissions and soil erosion to the environment, say Purdue University researchers. Environmental impacts from stover removal can be reduced by switching to no-till corn or adding winter cover crops, but these practices likely would increase production costs, researchers reported in a study. "Some crop rotation and tillage combinations are more environmentally benign than others," said Ben Gramig, a Purdue agricultural economist and the study's lead researcher. "But there are water quality and greenhouse gas tradeoffs when collecting stover." Stover is the parts of a corn plant that remain after grain harvest. Greenhouse gases from cropfields are released into the atmosphere when carbon escapes disturbed soils during stover removal. Emissions also occur when nitrogen fertilizer is applied to the land or crop residues decompose. Plowing fields loosens soil and, when combined with removing stover, causes increased soil erosion. Federal law requires 16 billion gallons of cellulosic ethanol be produced each year as part of the U.S. Renewable Fuel Standard. One RFS goal is to reduce the amount of greenhouse gas emissions. Greenhouse gases are believed to contribute to climate change. The Purdue study, "Environmental and Economic Trade-Offs in a Watershed When Using Corn Stover for Bioenergy," examined the environmental effects and costs of stover collection from eight corn-soybean rotation and continuous corn systems in a watershed typical of the eastern Corn Belt. The comparisons were made by combining results from watershed and greenhouse gas computer simulation models and minimizing the cost of stover collection, to select which farming practices to use in an agricultural watershed. In their analysis, Gramig, Purdue agricultural and biological engineer Indrajeet Chaubey and graduate researchers Cibin Raj and Carson Reeling found that a continuous corn system - corn grown on the same land year after year - planted with conventional tillage and removing 52 percent of the stover from the field released the most greenhouse gas and soil sediment per acre: 3.5 tons and 1.1 ton, respectively. That same acre of land yielded 2.7 tons of stover. If all the nitrogen contained in the stover that is removed must be replaced and there is more continuous corn cultivation, researchers found that greenhouse gas emissions from cropland may increase. At the low end of the environmental impact scale, a no-till corn-soybean rotation where 38 percent of the stover was removed emitted 2.7 tons of carbon dioxide per acre and yielded 2 tons of stover. "Combining no-till with continuous corn cultivation when stover is removed was capable of slightly lower sediment loss than the baseline today without any stover removal," Gramig said. "Introducing cover crops or replacing nitrogen that is removed with stover at lower rates was not considered in our study but should further reduce environmental impacts. These practices require additional study and would involve offsetting costs and savings." Perhaps not surprisingly, researchers found that removing stover increased production costs over the predominant corn-soybean rotation in place today. Most of that cost is attributed to replacing nitrogen contained in stover. Stover removal was found to have the lowest cost when collected from corn grown in rotation with soybeans. "For a given crop rotation and tillage system, as we simulated an increase in the rate of stover removal we found an increase in loss of sediment from crop fields, an increase in greenhouse gas flux to the atmosphere and a reduction in nitrate and total phosphorus delivered to waterways," Gramig said. "While optimizing production to maximize stover harvest at the lowest possible cost may lead to a reduction in nutrients delivered to rivers and streams, this comes at the expense of increased soil erosion and greenhouse gas emissions." More study is needed to identify less environmentally harmful stover removal practices, Gramig said. 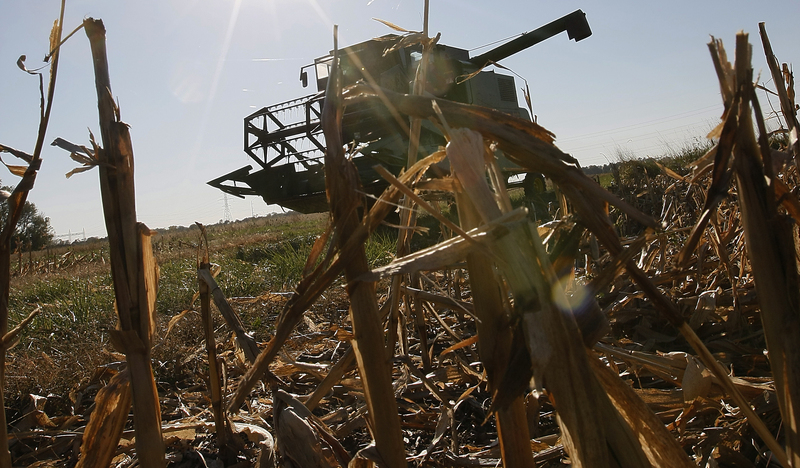 "In the meantime, farmers can use no-till to reduce the amount of sediment loss," he said. "Additional practices, such as the use of cover crops, are going to be necessary if we want to try to reduce greenhouse gas loss. We also need to determine what the correct nitrogen replacement rate is to maintain long-term soil productivity while minimizing nitrogen loss, whether to the atmosphere or to waterways." "Environmental and Economic Trade-Offs in a Watershed When Using Corn Stover for Bioenergy" appears in the January 2013 issue of Environmental Science & Technology. It is available online at http://dx.doi.org/10.1021/es303459h. Note to online editors: A link to a video clip of Ben Gramig discussing the Purdue corn stover collection study is at the bottom of this news release. The video can be embedded in your website.